I can still see carpet in my sewing room. To be honest, I haven’t put back all the stuff I squirreled in other places, and I just barely started a new project when my iron died. I took that as a sign from the universe that the shiny New Year will have to wait for a bit. Having no wish to revisit all of 2017, I decided to enjoy an extended Christmas. A bit of carpet still showing is one of the holiday happy things. This moose is another. My daughter sent me a collection of karate forest animals. The moose, of course, will have premier status. I know this period of limbo won’t last forever. The new iron will arrive tomorrow and I’ll be forced to review my list of project deadlines. 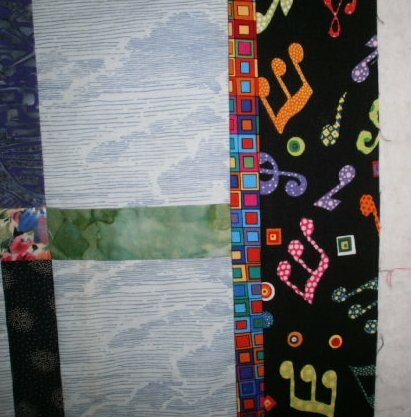 The first is a collection of blocks for Community Quilts. After I finish the blocks I’ll need to make some blocks for a friendship group, then start a new project for that same group. I’ve promised to make some baby quilts, and there’s the guild challenge to finish a project a month. In the midst of all that, I hope I remember my own personal, private challenge to restore some order to the sewing room. Perhaps this book will help. I’m not sure whether my guardian angels are asleep, the household gods are otherwise occupied, or the pixies under the stairs are bored, but for some reason things have been going wrong. Not wrong in the “ohmygod the sky is falling” sense, just “well, that’s something I’d prefer not dealing with at the moment.” For instance, I was making what I thought was great progress on a quilt top when I discovered I hadn’t measured correctly. The good news is I have more fabric for the original project, because the bad news is no amount of reverse engineering will make the units fit. Oh, and now I have a new project (and I’m not certain if that is good news or bad). You can see immediately that this is neither a smart nor safe way to keep beads. As often happens, the top came off one of the tubes. The truly amazing news is that the spill was localized, and I rescued at least 99% of the little darlings. So, what does one do on Days Like These? After I finished pouting, I remembered the mantra of a former boss: “If there are no dead bodies to hide, the problem can be managed.” That’s when I decided to take some time to enjoy the garden. This is part of our lily collection. They sit in their beds and bloom their little hearts out. This is a new plant. We bought it because of the flower, and the vine has rewarded us for our choice. I’m working on a couple of challenge quilts that may never be finished. Oh, they’ll be turned in, but they both keep telling me there is always room for one more bead. The challenge is Colors of the Vineyard. I started with the background fabric and put a vine on one and a tree on the other. My usual procedure is to quilt, bead and bind. This time, I bound them in the middle of beading so that at some point I can say the project is done (even if it is merely abandoned). I started beading grapes. That got old real fast, so I started beading around the motifs. Since I bead while watching TV, the needle kind of takes over. It’s like eating popcorn while watching a movie. Suddenly the bowl is empty and you don’t know how that happened. In this case, the fabric is encrusted but I have no idea when it happened. 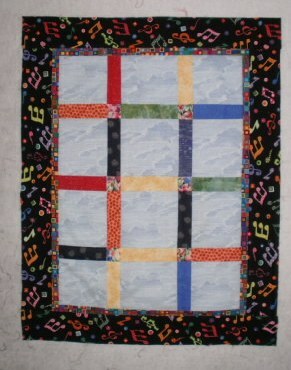 For this quilt, I intended to use a blanket stitch around the tree applique and leave it at that. Then I looked at all my beads, and realized the quilt desperately needed a bit of sparkle. I’ve been beading this quilt in front of the TV, too, but I forced myself to cover only one side of the trunk. I want it to look like moss. 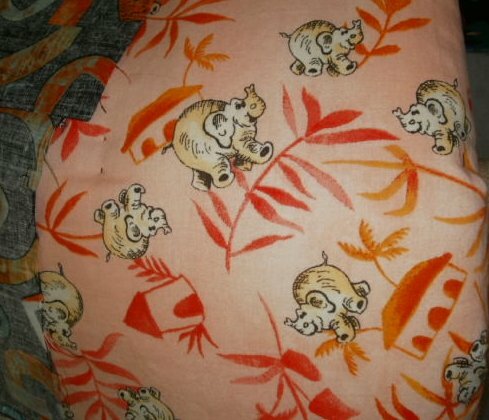 Auditioning fabrics – better one? I hadn’t intended to enter the tree into the challenge because it doesn’t meet the size requirement. My quilting buddies reminded me that if I made an underquilt the tree would meet the requirements just fine, thank you very much. The above fabric was my first choice (and not just because I could reach it easily). 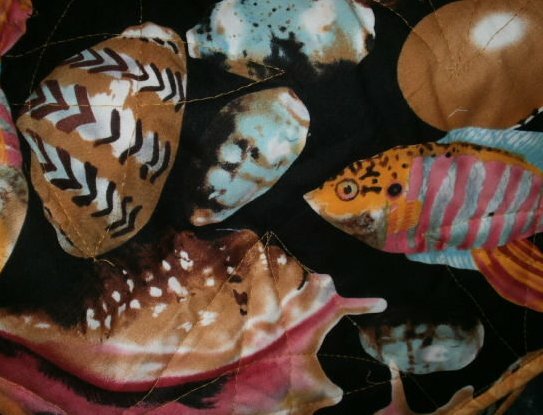 Auditioning fabrics – better two? This is my second choice. My third choice is to go shopping. I know which path my budget tells me to take, but that doesn’t mean I’m going to listen. I think I’ve mentioned that the art quilt critique group I belong to has decided to give ourselves art lessons. Specifically, we’re going to explore elements of design in a semi-structured way. None of us are in a position to enroll in a formal art program, so we’re going the do-it-yourself route. In the past, I’ve incorporated our assignments into a project I wanted to do anyway. I planned to treat our latest assignment, exploring negative space, the same way. Then I changed my mind. This is not the start to the project I need to get finished. It is, however, a good piece to explore negative space. The fabric for the tree limbs seems to drop away from view. That’s partly because it is a delicately grayed green, and grayed colors retreat. The background contributes to the effect, because it is so exuberantly busy. 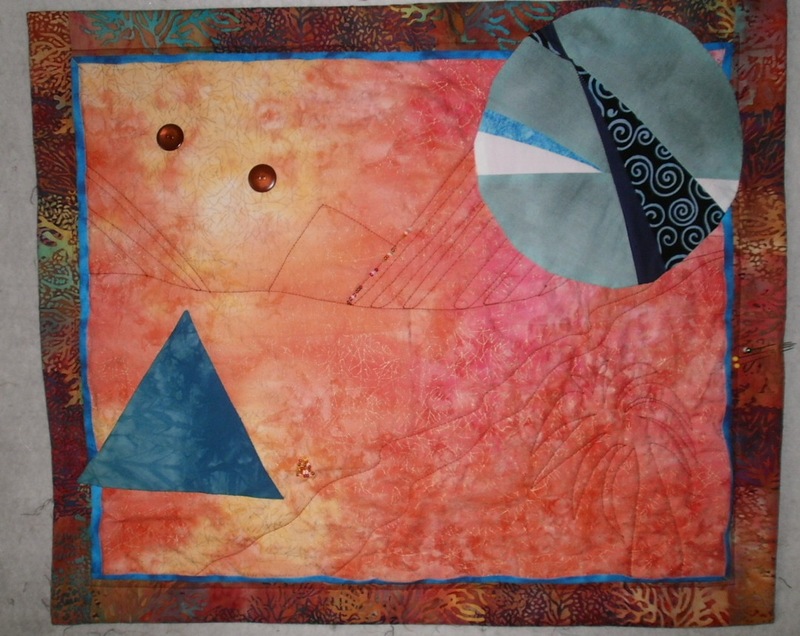 So I thought, and realized that I had the opportunity to do something new in my art quilting. 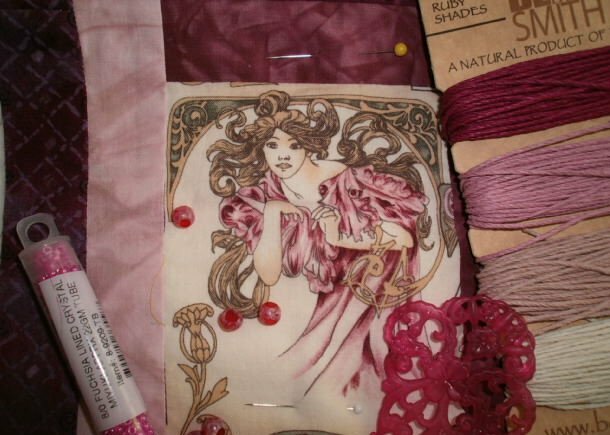 I could use a project as an art journal page, in effect giving myself permission to abandon a piece if it didn’t work. I fused the green branches onto a small bit of the background and immediately realized the fabric wouldn’t do at all for my challenge piece. 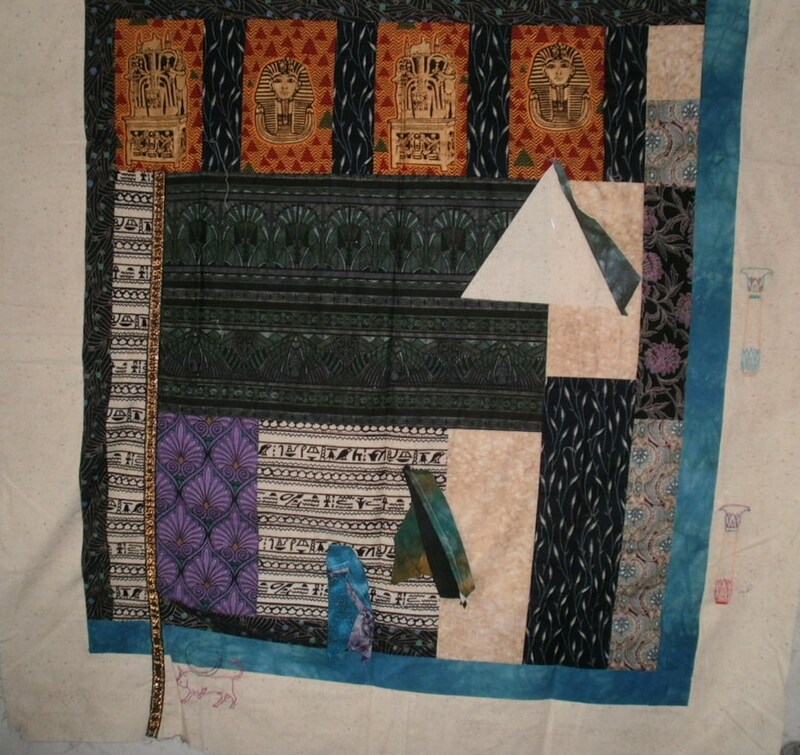 I will show the green piece at the next art quilt critique meeting, and ask the other members what they would do if it were their quilt. If I like their ideas, the project may evolve, but if not it has a place in my art journal. I’m already beading the yellow piece for the challenge. And I’m very excited to be taking baby steps toward becoming a more dedicated art student. 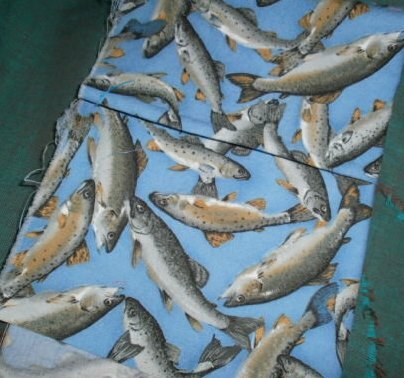 I like fish fabric. For years, I’ve collected yardage of trout, angel fish, koi, sharks – even whales and dolphins although they are mammals, not fish. For years, I’ve snuck the odd piece into other projects when I was low on ideas for my fish series. Now, I have the Challenge Group Rainbow Project. 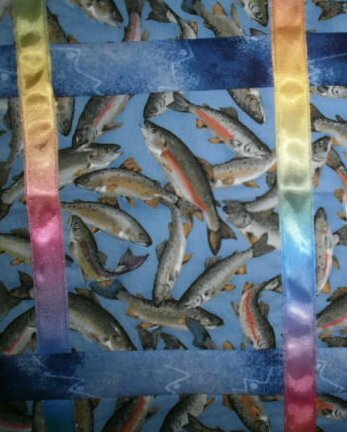 It turns out these are speckled trout, but a few swipes with some watercolor pencils and they become rainbow trout. I also got to use the remnants of some rainbow ribbon, which made me very happy. 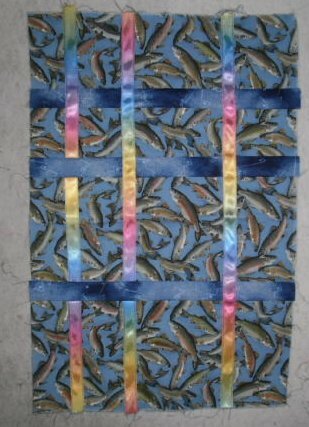 When the fish top was pieced, I decided I needed to do a project that followed the rules of the Challenge. We were tasked with using all the colors of the rainbow, not just the theme of rainbow. My job was made easier in that some of the scraps on my cutting board could be drafted for a rainbow-esque treatment. The deadline for this project is October, so there’s a chance I might have these pieces quilted, bound and embellished by then. It won’t happen today, however, because we’re having company for the Scottish Games, and my sewing room is going to become a guest room for the weekend – assuming I can find a wormhole in the fabric of the universe to hide all my treasures. Three quilts waited for me this week, layered and basted. 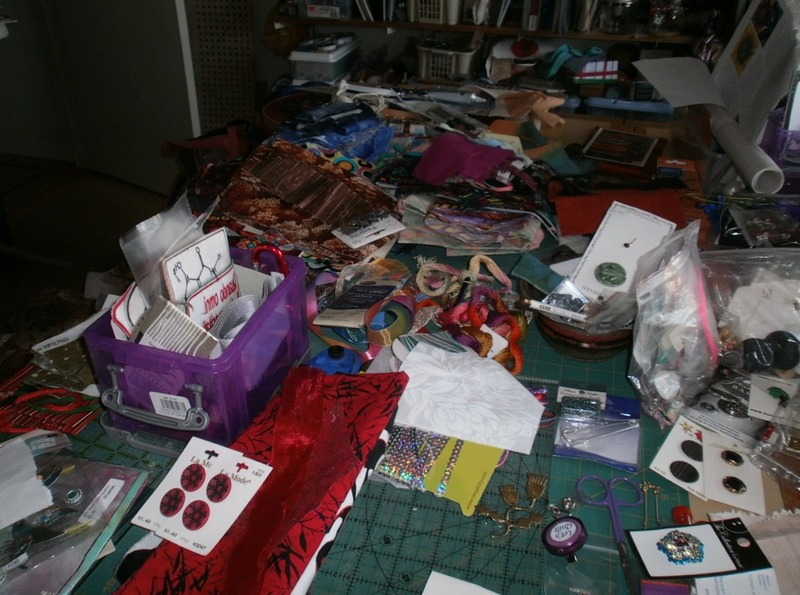 The sewing table was cleared (well, cleared enough), but my calendar was not. 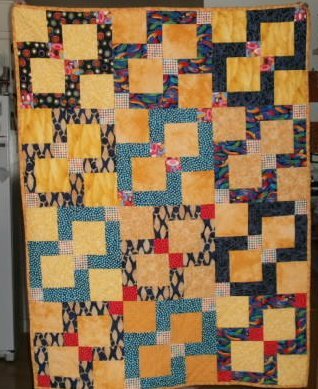 This was one of those weeks when I had to accept what I accomplished as the best I could do, because life got in the way of quilting. The good news is, I finished a gift quilt. This will go to one of my brother’s grandsons. Here is the back. The quilt for my brother’s second grandson is next on the stack to be quilted. Here is the back for it. The third quilt is the Challenge project. It is much smaller, but will require some embellishment. Lucky for me, I found a new bead shop. Yes, I know, I probably have beads just like this somewhere in the sewing room, but I think finding the new bead store was my reward for not grumbling when I had to spend a day in an unfamiliar city for family matters. Sometimes, the best you can do is to take the bead in the hand and ignore the bead in the bin.